Seared Tuna Salad with a Miso Vinaigrette - Home. Made. Interest. 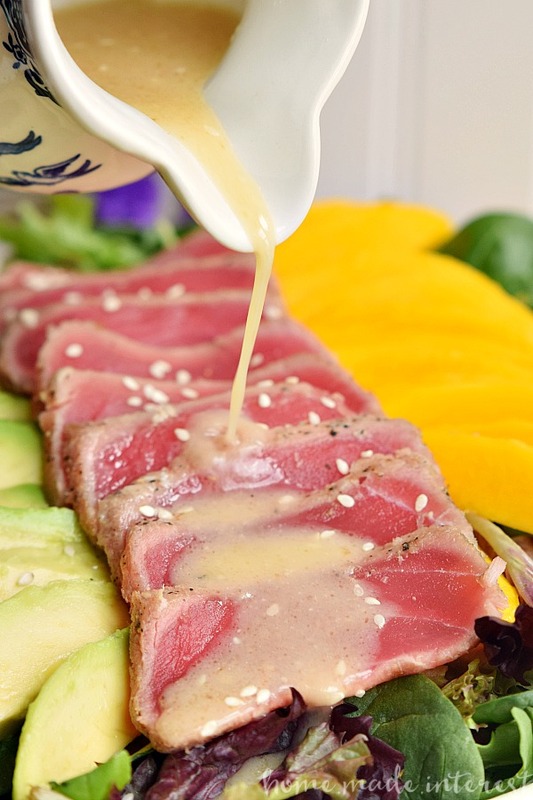 This light and fresh Seared Tuna Salad is a healthy lunch option mixed with mangoes and avocados and topped with a Miso vinaigrette. I was going to start today’s post by saying now that it’s getting warmer outside, but today I woke up and it was 30 degrees outside :(. That’s Spring in Maryland! This weekend it should be warmer though and I can’t wait to spend a little time outside in the sunshine. I don’t know about you but for me spring and summer are salad season. I find myself craving fresh fruits and vegetables, and light but filling proteins like fish. 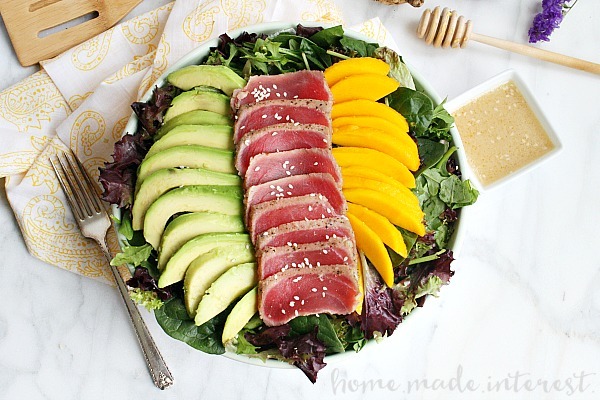 Ahi tuna is one of my favorite salad ingredients right now because you can combine it with so many different things and it is so much easier to get my hands on now that Bumble Bee has come out with their Bumble Bee SuperFresh® line of naturally-seasoned, restaurant quality, prepared seafood. Bumble Bee SuperFresh® Seared Ahi Tuna with Garlic-Peppercorn Rub is the first ever sushi quality “thaw and serve” packaged seafood product you just defrost it in your fridge for approximately 3 hours and it is ready to plate. Its quality is on par with what you expect from fine chefs who know how to source the best product for their restaurants. Last week I was playing around with Asian flavors and I made this amazing Miso Vinaigrette to go along with my Ahi tuna. 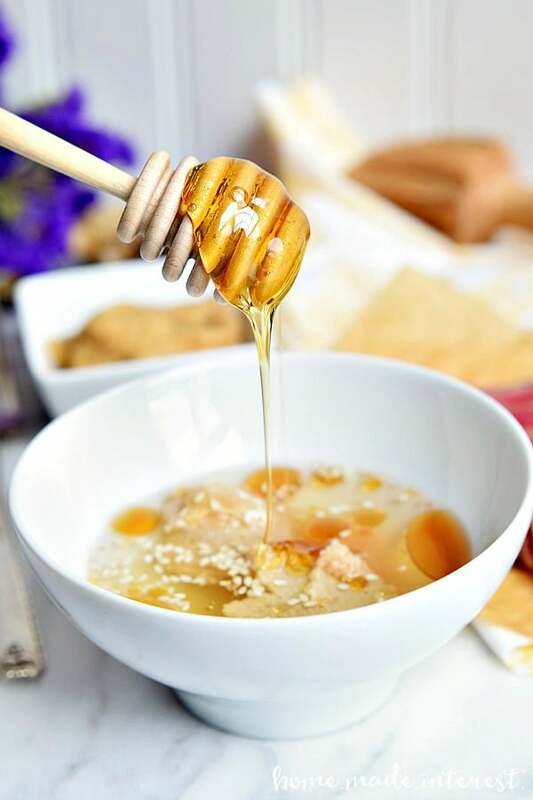 It is a simple mixture of miso paste, sesame seeds, sesame oil, rice vinegar, fresh ginger, and honey. You just whisk everything together and you have this vinaigrette that is sweet, and salty, with a toasted flavor from the sesame oil. I poured it over a salad made of greens, a fresh mango, and a fresh avocado. The package of Bumble Bee SuperFresh® Seared Ahi Tuna with Garlic-Peppercorn Rub serves two so this salad made the perfect light dinner for my and my guy. He was really impressed with the flavor of the tuna and we both agreed I need to make this again soon! 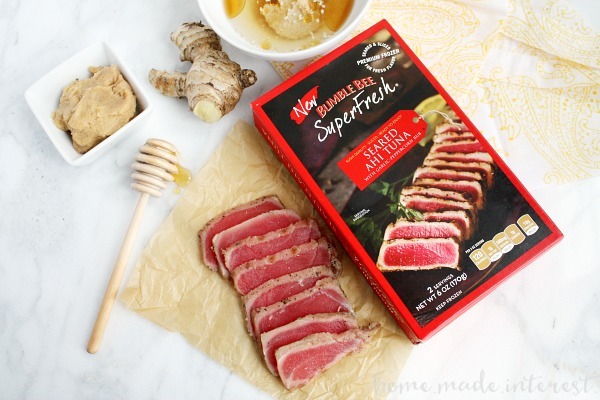 Prepare Bumble Bee SuperFresh® Seared Ahi Tuna with Garlic-Peppercorn Rub according to package instructions. Thinly slice mango and avocado. 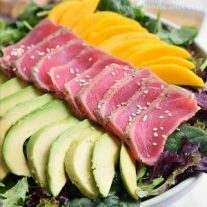 Fill bowl with greens and then top with mango, avocado, and Bumble Bee SuperFresh® Seared Ahi Tuna with Garlic-Peppercorn Rub. Add remaining ingredients to a separate bowl and whisk together until combined. Pour miso vinaigrette over salad and enjoy! The Bumble Bee SuperFresh® seafood line includes more than just Ahi tuna. Their premium Salmon and Tilapia come with their own parchment paper baking pouch and go from freezer to table in under 25 minutes. High in protein, richly seasoned with pure and simple ingredients that let the fish shine through! All of their seafood is frozen from the time it is harvested until you are ready to prepare it, unlike most of the “fresh” fish you find at the seafood counter, so it is fresh tasting, and fresh smelling (no fishy smell!). You can find Bumble Bee SuperFresh® in the frozen seafood section, typically near the seafood counter, at your local grocery store. If you’re looking for a seafood solution that is no mess, and no fuss; just pure perfection, time after time check their store locator HERE and pick some up this week. Next Post » Cheese Taco Shells for a Low Carb Taco Night! I need to find this ASAP! Love the idea of not having to choose a good piece of tuna at the grocery store! I was really impressed with the quality and I agree it makes life so much easier!